That would’ve sucked though, right? Well, in less than 24 hours, we won’t be kidding. Poplink is a tool that gives you the ability to add striking CTA pop-ups to the links you share. Meaning, you can turn every link, article, or blog post that you share on social media into a lead magnet for your own website, blog, or product! So, while other people are doing the dirty work (creating new content), you’re staying active on social media by sharing their content and increasing conversions. Poplink is the definition of working smarter, not harder. With these CTA pop-up conversion machines, email lists will grow, website traffic will increase, apps will get downloaded, and products will be bought. 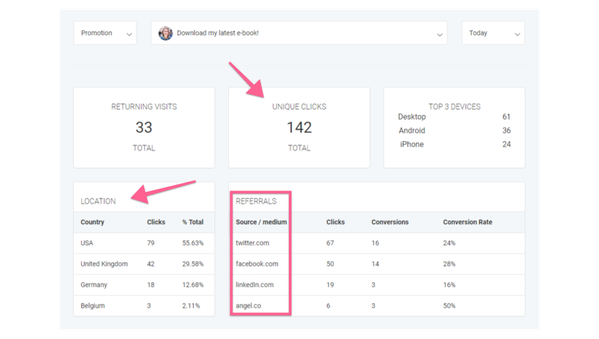 The Poplink links you share offer up solid analytical data exports via PDF/CSV in the form of impressions, clicks, conversions, etc. In case you forgot, access to AppSumo Poplink Plan is valued at $948 per year. But, in these final 24 hours, Sumolings can get lifetime access to the AppSumo Poplink Plan for just $39! Don’t let your procrastination cost you conversions! Click here for lifetime access to the AppSumo Poplink Plan! P.S. Check out these integrations that are coming soon! Lock this deal in now and get access to these once they’re released!